Illuminated manuscript on vellum, an early work by the Mazarine Master. 225 leaves, complete. With 30 large miniatures with full borders, and numerous one- to three-line initials in colours and burnished gold, the smaller with intricate penwork. This elegant Book of Hours includes 30 outstanding miniatures with full borders in gold, red, and blue, with wine leaves, small flowers, three-sided bars of burnished gold and colours, some with dragon terminals. The handsome miniatures are mainly the work of the Mazarine Master, named for a Book of Hours in the Parisian Bibliothèque Mazarine, ms. 469. 189 x 132 mm. – 225 leaves, complete. With 30 large miniatures with full borders, and numerous one- to three-line initials in colours and burnished gold, the smaller with intricate penwork. 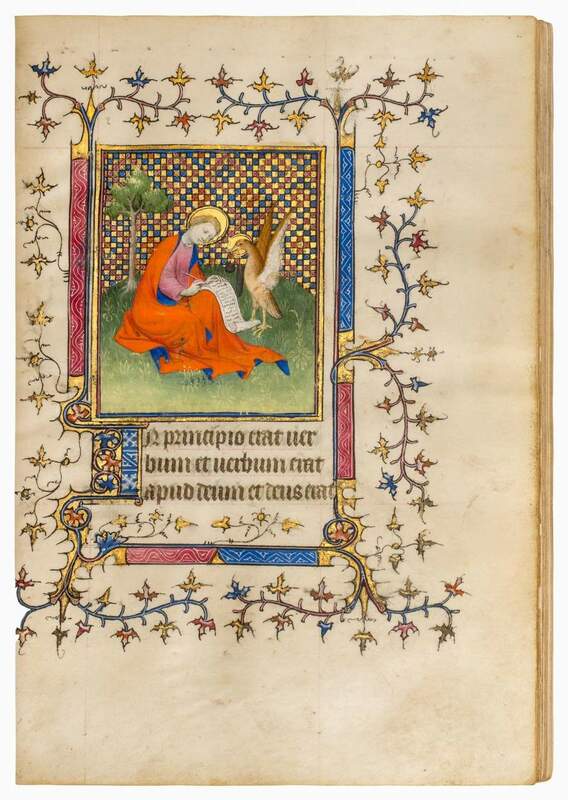 Recent research suggests that it is an early work by the Mazarine Master, who was one of the best illuminators in Paris at the turn of the century. His work shows a difstinctive palette, which is, especially in the eponymous manuscript, determined by a rare lime-green that he used progressively more often in his mature works, but which is used in our book only once. Judging from the archaic wine leaf tendrils, we may assume that this book is among his earliest works, dated around 1405. The artist’s awareness of hierarchy in the secondary decoration is already perceptible here. He surrounds the two most important miniatures, the Annunciation and God in Majesty, with three-sided solid gold bars while the other miniatures are less elaborately framed. He also uses more delicate, complex tendrils for these two borders. The master likes to combine complementary colours, frequently using radiant orange contrasted with vivid green or accompanied by pale rose. His main interest seems to be drapery, the folds of which are moulded delicately with different shades of the same tone. His faces are minutely defined by brush strokes on a greenish foundation. See also this miniature of St. Peter by the Mazarine Master.